Home Redistricting Should Political Subdivisions Stay Whole? It seems like the more people advocating on behalf of something, the better. But when it comes to representation, what may sound good in theory rarely works out in practice. Divisions do not strengthen a position, but weaken it. According to the extensive testimony presented in redistricting public hearings (on Sept 7, Sept 14 A & B, Nov 18 A & B, and Nov 23 A & B), political subdivisions benefit from remaining whole and suffer when divided more times than required by their population. It is perhaps an illustration of the maxim: “divide and conquer”. In redistricting, this tactic might be used to weaken the voice of the people living in political subdivisions – like counties, cities, boroughs, townships, wards – by dividing these places into smaller pieces. The division does not serve to strengthen their voice, but dilute it. In excessive instances, the subdivision is divided into fragments so small that the residents form an immaterial portion of a district. Monroe County offers an example of this. Residents of Monroe might say there are at least 7 million reasons why political subdivisions should remain whole – they lost an alleged $7 million dollars due to Monroe County being fractured between so many different districts. They shared their story during the first 30 minutes of the Sept 7 Hearing. Political subdivisions are also the only existing boundaries that divide up our state into clearly defined areas and regions (like counties, cities, etc.). Because they already exist, these boundaries offer a neutral and non-partisan basis for forming legislative districts. Our founders did not choose party affiliation, ethnic background, economic standing, religious beliefs, or other opinions as the basis for forming districting. Counties, cities, townships, etc. all represent people bound together by a natural, pre-existing, and common interest. This interest is what the founders of Pennsylvania sought to protect when authoring the rules governing representation in our constitution. Our founders found that people, when unified as a political subdivision into one representative voice, offered citizens the strongest say possible in their government. Protecting the say of the people in their government is the true point behind unified political subdivisions. Perhaps traces of the principle behind this constitutional rule can be found in The Federalist #10 by James Madison. Governance first begins with each person managing their own home and property. These houses are united into a Precinct. Precincts are united into Wards, Boroughs, and Townships. Wards are united into Cities. These are then united into Counties. Counties are united into States. States are united into one nation/country known as the United States. Cities, Boroughs, Townships, and Wards within a County were united into House districts. 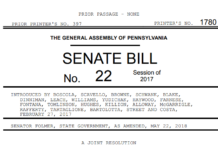 For more information on this aspect of redistricting, read A Story of Reapportionment. It lends strength and significance to residents. It serves as a natural and impartial standard. It offers a unified and personal voice. Learn more in related articles: Does Representation Matter to Me? and A Story of Reapportionment. Sign-up for email updates to receive the latest posts.